I have ALWAYS wanted to try making Eclairs. Its one of those delectable pastries, that on pastry trays, are few in number and quickly taken. I have short arms (hey, I am 5 ft short) and never seem to get them in time. When I think of Eclairs, I think of the movie “Simply Irresistible” with Sarah Michelle Gellar (Amanda) and Sean Patrick Flanery (Tom). There are two scenes, one where Amanda, is happy (or in love, can’t remember) and she starts cooking, as though in a trance. She ends up making these eclairs, which she brings to Tom. Tom tries these eclairs and immediately, whatever feelings Amanda had, while making those eclairs, Tom starts feeling. He falls in love with the food and her. Don’t worry, I didn’t do anything weird to my eclairs but I was happy, while I was making them and I am thankful to all my family and friends! Thank you all for the wonderful comments and birthday wishes! Remove from heat and add flour and whisk. Cook until dough does not stick to the sides of the pan. Bake eclairs for 10 minutes at 425F and then decrease oven temperature to 385F and bake for an additional 10-12 minutes with oven door slightly opened. Whisk, in a separate bowl, yolks and sugar until eggs become whiter. Make a small cut in each cooled eclair, on its side, forming a pocket. Wow! I hope you had a great trip! Glad you are back! I like the slide show! Eclairs are delicious. I nominated you for the stylish blogger award. Read about it on my blog. Keep up the awesome work! Thanks Summersher!!! You are too awesome! Happy Birthday 🙂 I hope someone made you a cake too! Too funny! 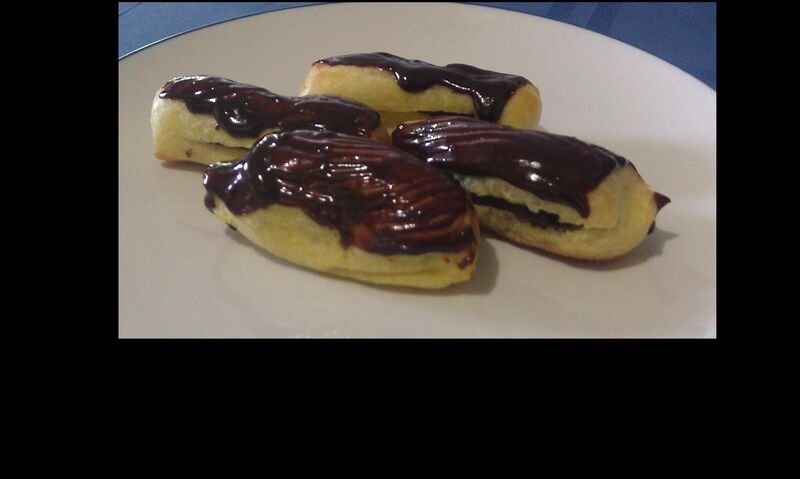 I just made some cream puffs and mini eclairs tonight!!! Happy birthday, I hope you have a lovely day!